Justice Minister Pavlo Petrenko has issued orders to quash the status and rights of the Communist Party of Ukraine, the Communist Party (renewed) and the Communist Party of Workers and Peasants of Ukraine. "After the adoption of laws [on de-communization], an independent commission was established, which was checking the activities of the three communist parties of Ukraine - the Communist Party, the Communist Party (renewed) and the Communist Party Workers and Peasants of Ukraine for a month. Based on the findings of the commission, I have signed three orders that say that the communist parties of Ukraine, in particular, in terms of their activities, their names, their symbols, their statutes and their programs, do not meet the requirements of Part 2 of Article 3 of the Law on the condemnation of the Communist and National Socialist (Nazi) totalitarian regimes in Ukraine and the prohibition of propaganda of their symbols. 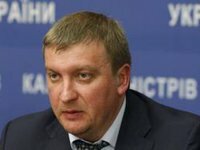 Starting from today, this political force and two other Communist parties cannot be the subject of the electoral process and cannot take part in the political life of the country," Petrenko said at a briefing in Kyiv on Friday. He stressed that the Justice Ministry will take the process of banning all communist parties to its logical conclusion and will seek a relevant court ruling.